Your electrical system is a vital part of your home, providing you with power for light, heat and all of the countless appliances that define our modern age. We live in a very old town, whoever, and Hartford electrical systems may be almost as old as some of the stately homes that line our streets. Older wiring systems can present a hazard and may not match with current Connecticut building codes regardless. Here are a few easy tips to help you determine when you need rewiring. Look for signs of faulty electrical systems. This can include black marks or similar signs of damage on outlets, switches and lights as well as regular power overloads triggering the circuit breaker (or blowing a fuse if your house doesn’t have a breaker box). Check to see how old your system is. If it predates the current code, you may need to upgrade it. Signs of an outdated system can include the presence of an older fuse box instead of a breaker box; outlets with rounded holes instead of modern ones; the lack of GFCI (Ground Fault Circuit Interrupter) outlets in bathrooms and kitchens; the presence of limited outlets in rooms (maybe only one or two); and the lack of insulation on internal wiring. Look for signs of shoddy workmanship during the initial installation. It may have happened well before you took up occupancy in the house, but you can still notice signs of a subpar electrical job: plugs that haven’t been flushed properly or that show live parts; cables installed diagonally instead of horizontally or vertically; and damage left on the walls or nearby locations. If any of these conditions seem to fit your home, call a qualified professional immediately. In older towns like Hartford, electrical issues do not get better with age, and the sooner you can replace your wiring with a safe, modern system the better. 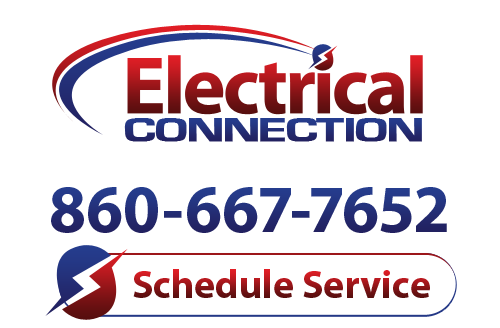 The experts at Electrical Connection have the skills and experience to perform a rewiring, and can provide sound consultation on the matter before beginning any procedure. Call us today to make an appointment.